Photovoltaics just got a whole lot more glam, thanks to Dutch designer Pauline van Dongen, who unveiled her "Solar Shirt" at SXSW Interactive in Austin on Friday. The follow-up to her "Wearable Solar" line of sun-powered garments, the sleek if otherwise unassuming tee is the high-street's answer to high-tech. Solar Shirt, which was created in collaboration with Holst Centre in the Netherlands, generates its power from 120 thin-film solar modules that are integrated into the garment's fabric. In sunny weather, it produces roughly 1 watt of electricity, or enough to charge an iPhone in a few hours. But cellphones aren’t the only things the Solar Shirt can keep humming. Van Dongen’s garment can also juice up MP3 players, cameras, Global Positioning System units, and other USB-compatible portables. Plus, any excess electricity can be stored in the shirt’s battery pack for later use. While previous attempts to combine solar power with fashion resulted in one-off haute-couture designs, Holst Centre’s stretchable—not to mention washable—interconnect technology made the process more seamless proposition. “We’ve taken solar fashion from the catwalk to the high street, with an attractive yet practical garment that people could wear every day,” van Dongen says. Solar Shirt isn’t just a proof of concept; it’s something textile manufacturers could bring to market in a matter of months with current production capabilities, according to Holst Centre’s Margreet de Kok. “Pauline is one of the leading names in wearable technology, and her design shows how technology and fashion can complement each other to create desirable clothing that has a function,” she adds. But cellphones aren't the only things the Solar Shirt can keep humming. Van Dongen's garment can also juice up MP3 players, cameras, Global Positioning System units, and other USB-compatible portables. Plus, any excess electricity can be stored in the shirt's battery pack for later use. “Wearing solar cells lets us harness the sun’s potential energy and become a power source ourselves," van Dongen says in a statement. 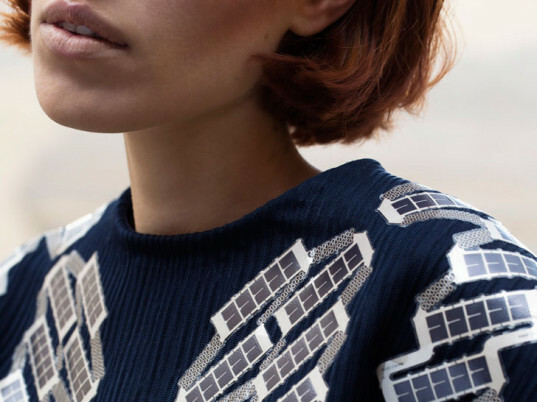 "As a designer, I’m excited by how solar cells can add to the aesthetic of a garment." While previous attempts to combine solar power with fashion resulted in one-off haute-couture designs, Holst Centre's stretchable—not to mention washable—interconnect technology made the process more seamless proposition. "We’ve taken solar fashion from the catwalk to the high street, with an attractive yet practical garment that people could wear every day,” van Dongen says. Solar Shirt isn't just a proof of concept; it's something textile manufacturers could bring to market in a matter of months with current production capabilities, according to Holst Centre’s Margreet de Kok.